Age is nothing but a number and former Tanzanian singer K Lynn recently proved this after taking to social media to praise her hubby who is almost double her age. 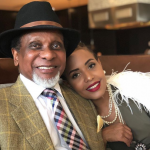 Billionaire Reginald Mengi, 75, got married to Jacqueline Ntuyabaliwe alias K Lynn who is now 40 years several years ago. Many argued that Lynn fell for her because of his money but four years later and two kids, the couple is still going strong. Strong She recently took to social media to praise her hubby for the love he has been showing her leaving many tongue tied. “ I couldn’t have wished for a better man to share my life with, a man who has become my best friend, my rock, my mentor, and my pride. Happy Anniversary sweetheart, I love you.❤️ Thank you for showing me how it really feels to be loved and cared for.❤️❤️❤️ ” she said the former Miss Tanzania. Still, many were not happy with her post and rebuked her for falling in love with an old man and pretended she was in love. The post Former singer K Lynn praises 75-year-old billionaire husband for loving her right appeared first on Ghafla! Kenya.